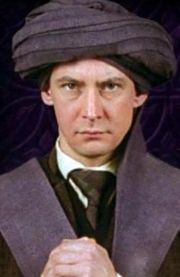 25 May: Harry overhears Quirrell arguing with Lord Voldemort, and assumes that Snape is threatening Quirrell. 26 May: Harry Potter, Hermione Granger, Neville Longbottom, and Draco Malfoy serve detention in the Forbidden Forest with Rubeus Hagrid. They spot a dead unicorn and Harry encounters Lord Voldemort for the first time since his infancy. 4 June: Harry, Ron, and Hermione keep the Philosopher's Stone from Professor Quirrell, Quirrell dies and Lord Voldemort leaves the physical world once again without a body. 31 July: Harry, on his twelfth birthday, is visited by Dobby. He receives a warning from the Improper Use of Magic Office. Harry is rescued from 4 Privet Drive by Ron and Fred and George Weasley, and they go to the Burrow. Harry, Hermione, and the Weasleys shop in Diagon Alley. In Flourish and Blotts, they meet Gilderoy Lockhart and Lucius Malfoy. Lucius slips an old school diary of Tom Riddle’s to Ginny Weasley 's cauldron. He also starts a fight with Arthur Weasley. Between 1 September and 18 December: Armando Dippet dies. 1 September: Ginny Weasley, Luna Lovegood, Colin Creevey and Harper begin at Hogwarts School of Witchcraft and Wizardry. Harry and Ron miss the Hogwarts Express and fly a car to school. 8 September: The Chamber of Secrets is opened by Ginny Weasley, under the influence of Tom Riddle’s diary. 31 October: The Chamber of Secrets is opened again and the basilisk petrifies Mrs. Norris. 8 November: Colin Creevey is petrified by the basilisk. Winter: A secret passage behind a mirror on the fourth floor caves in, forcing Fred and George to stop using it. It formerly led to Hogsmeade. December: Sometime during the week before Christmas, the British Ministry of Magic conducts a raid on Malfoy Manor, but fails to find anything. 17 December: At the first meeting of the Dueling Club, Harry Potter speaks Parseltongue and many suspect that he is the Heir of Salazar Slytherin. 18 December: Justin Finch-Fletchley and Nearly-Headless Nick are petrified by the basilisk. 25 December: Hermione Granger finishes brewing Polyjuice Potion. Harry Potter and Ron Weasley use it to take on the appearances of Gregory Goyle and Vincent Crabbe, respectively, while Hermione accidentally turns partially into a cat. August: The Chudley Cannons were ninth in the British and Irish Quidditch League. Unnamed 'runt' dog of Marjorie Dursley. This page was last edited on 10 August 2015, at 12:49. This text is available under the GNU FDL and may have been adapted from the Wikipedia article about 1992 (history).